New Jersey Power of Attorney Forms must be utilized to grant authority to another person to act on your behalf for financial matters and transactions. The type of appointment this power of attorney delivers, however, is not ‘durable.’ It becomes void if the principal is found to be incapacitated. This is a precaution against an agent’s unfettered use of principal power beyond the time when the principal has the ability to revoke. 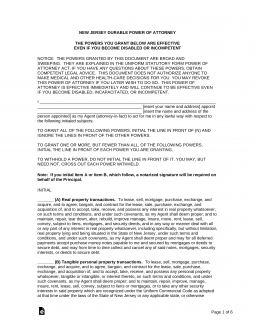 The language required to set this type of limitation is included in this document, and the principal must approve all such directives for them to be applicable. The power of attorney statutes in New Jersey can be found at Title 46 of the New Jersey Revised Statutes. Durable Power of Attorney – Conveys general powers over one’s property and assets to another. It will stay in effect even if the person creating it can no longer make his or her own decisions. Signing Requirements (§ 46:2B-8.9): Acknowledged by a notary public in accordance with § 46:14-2.1. General Power of Attorney – Just like the durable form in that it conveys certain powers over property and assets, but instead of staying in effect upon the principal’s incapacity, it becomes void, upon incapacity. Limited Power of Attorney – Use for specifically defined transactions or time periods. It is only in effect for the intended transaction and is void thereafter. Health Care Power of Attorney (Proxy Directive) – Allows a person to appoint someone to act on their behalf with regard to health care issues. This is only effective if the person who made the directive is in a condition where they cannot make their own decisions. Signing Requirements (§ 26:2H-56): Notary public or two (2) witnesses. Minor Child Power of Attorney – Allows you to give authority to another to take care of your children in the event of your absence. Revocation of Power of Attorney – Use to revoke a POA. It is important that this executed form is provided to the agent and any others relying on the POA so that they receive notice of its revocation. Signing Requirements (§ 46:2B-8.10): Acknowledged by a notary public in accordance with § 46:14-2.1. Tax Power of Attorney (Form M-5008-R) – Use to give authority to another, usually a tax professional, to represent your interests in front of the tax authorities. Signing Requirements: Principal and representative. Vehicle Power of Attorney – Use to give authority to another to represent your motor vehicle interests with the motor vehicle commission.